I’ve made various enriched dough recipes for brioche type bread as well as sweet rolls. Just before Christmas (2018), I saw this on SmittenKitchen for Baklava Babka. 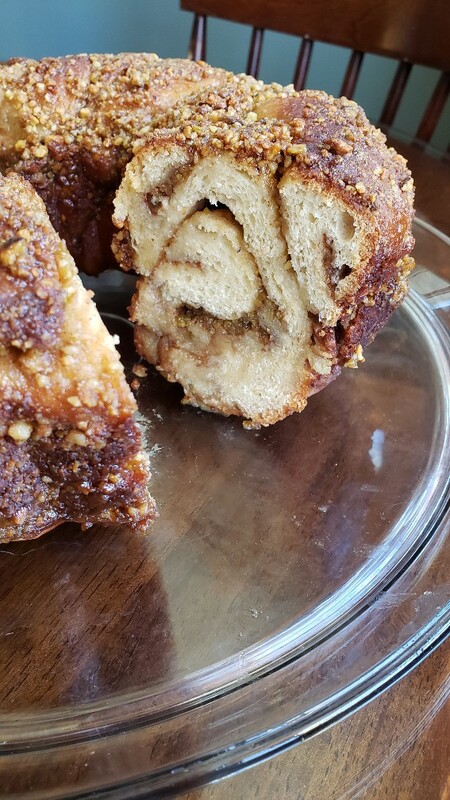 I do not like the crunchy, super sweet baklava but I loved the look of this softer babka and it was so pretty in the “round”. @Fermentada (Melissa) had introduced me to using a sweet, stiff starter when she, with me following close behind, made sourdough raised donuts. From my minimal reading, there is a difference in the type of acid produced with a stiff starter vs a liquid starter. At any rate, I continued using a sweet, stiff starter when making sweet, enriched doughs. I converted the SK recipe to use a sweet, stiff starter by just baking out the amounts of all in the starter from the related ingredients. stiff sweet starter: 90 grams flour, 25 grams active starter (whatever your regular bread starter is), 40 g water and 20 g sugar. I usually mix this in the evening. I then use a stand mixer for this dough so not exactly a no knead and if you want to combine by hand go for it. For myself, combining the eggs, sugar and butter is easier with the mixer. After mixing, I let it sit at room temp for 2-4 hours and then into the frig for 24 (ish) hours. Let the dough warm, roll / shape as you want. 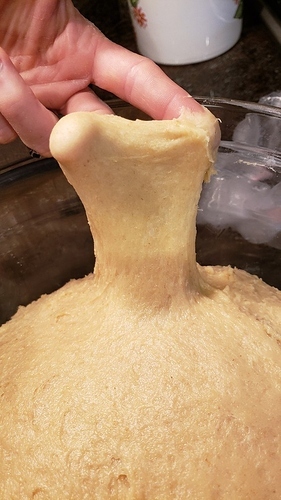 I make cinnamon rolls, babka like sweet roll, “Danish”, and doughnuts with this dough. 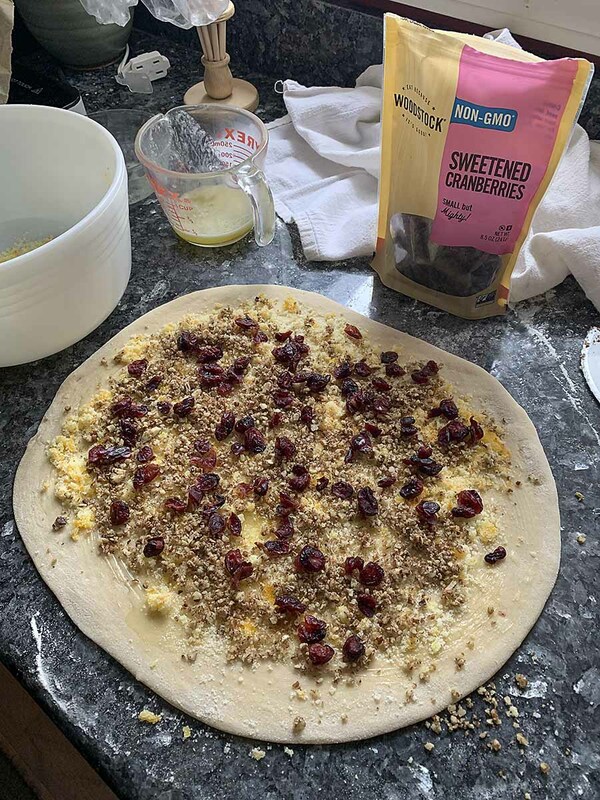 Directions for the babka rolling and shaping are well documented in the Smitten Kitchen recipe as well as in @Fermentada’s Sourdough Naan Babka on this site: . This dough freezes well, baked items from the dough freeze well also so do not hesitate making a full recipe and freezing either dough, slices, rolls. Some notes: The stiff starter does not grow or bubble like a liquid starter. I haven’t worried too much about it and use it after 12 hours with no issue. Additionally, the dough itself does not rise much and seems a bit stiff out of the refrigerator. My experience has been that as it warms up, it puffs up a bit and with some gentle kneading before shaping, becomes much softer. Whatever I’ve made with it, then rises normally after shaping. I go for about 25-30% rise after shaping. 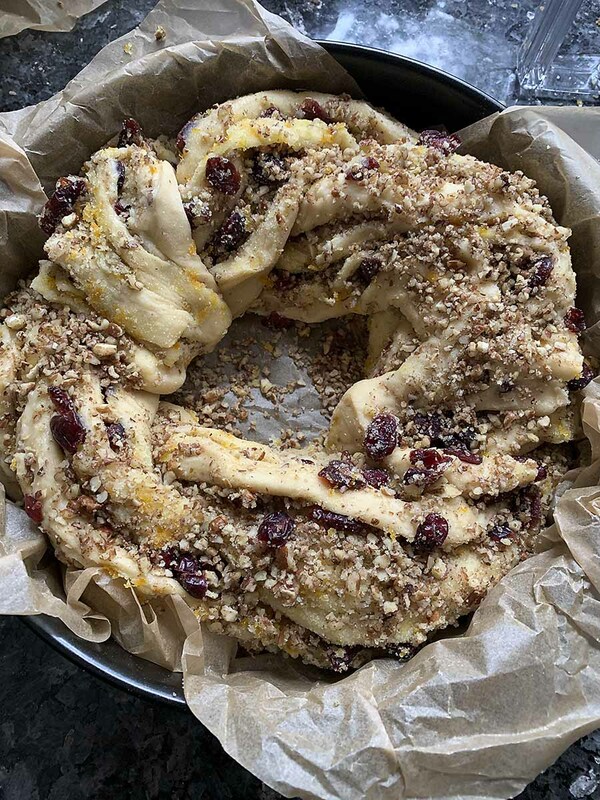 The last time I made a babka with the dough, I departed from the cinnamon-nut filling and used walnuts, orange zest, sugar and dried cranberries with an orange syrup instead of honey syrup. That was my favorite to date. Softened butter like for cinnamon rolls, then the sugar zest mix and then the fruit (whatever looks good to me). I think I use about a cup of crushed walnuts or pecans. 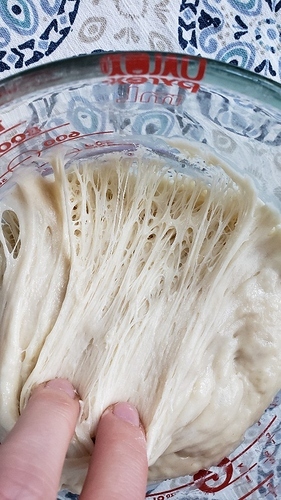 Above is half the dough. 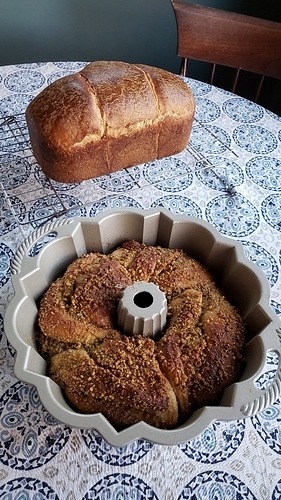 Even if making a round, I split the dough and work with half at a time and join them for a circle or you can bake 2 loaves OR you can cut like cinnamon rolls. 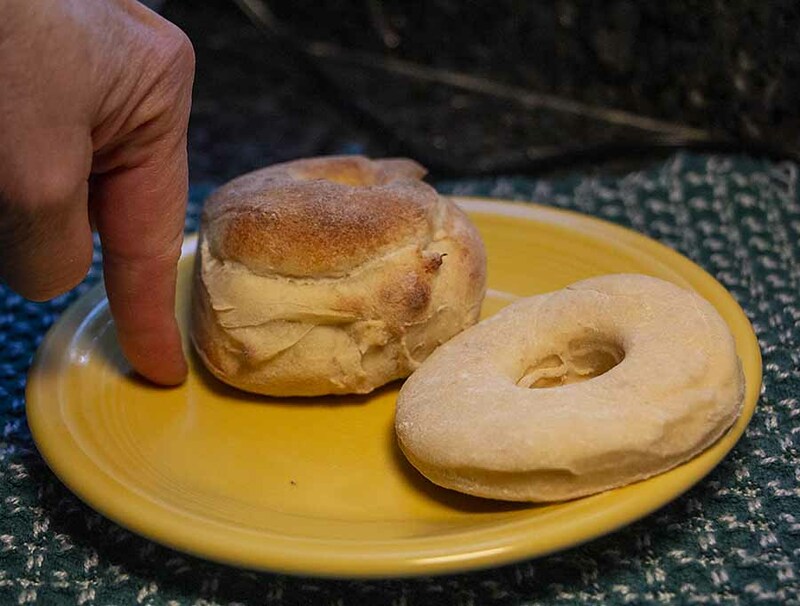 On the right is a cut, frozen and then lightly thawed donut. On the left is after air frying (5 min and 350). You can deep fry but I was amazed at how well the air fry did for a faster, less mess, I want it NOW! - donut. Here is my testimonial that this recipe is great! I made it last week. I agree with Liz about the slow and not huge expansion of the dough as it bulks… You need to be patient but also not expect a blown up dough. My dough bulked all day at around 68F and I popped it in the fridge at the end for a little over an hour to make it stiffer for rolling. Then I proved it overnight at 50F in a beer lagering refrigerator plus a couple more hours at room temp. Fyi, the brioche pan loaf needed longer to cook (60-65 minutes) than the babka. This double batch of the recipe above and it didn’t all fit in my stand mixer very well, so I ended up slapping and folding it on my counter to incorporate the butter and get good gluten development. My strategy lately with double batches has been to run the mixer for a while with the lid half open (because if I close it, the dough will be over the top of the attachment) and then transfer to the counter for kneading or slapping and folding. Next time I might try rolling the dough thinner so that my layers are finer but overall I was really happy with how this turned out. Photos not in order: stiff starter, window pane, finished loaves, babka cross-section. And I forgot, I also have added some whole grain. I’ve added maybe 20% whole wheat pastry flour and think I could add even a bit higher %.